Have you ever wanted to perform a service for your community, but didn't know where to start? There are so many projects that would benefit from the attention of caring adults. That's why we encourage you to belong to an Optimist Club. More than 100,000 like-minded people are Optimists. Together, we bring out the best in kids. Help activate a group of Optimists in your community. Build an Optimist Club today. 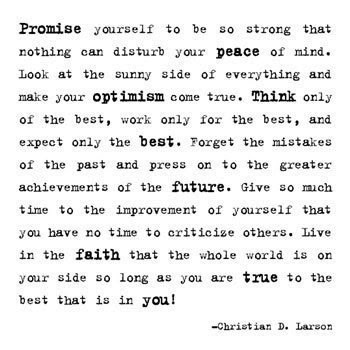 People are talking about the Optimist Creed today. The author of "The Secret" has posted it on their website and emailed their subscribers the sacred words of every Optimist Club. Optimist Clubs can be found around the thirty-six countries around the world. Whenever Optimists gather, they recite the Optimist Creed. To give so much time to the improvement of your self that you have no time to criticize others. To be too large for worry, to noble for anger, to strong for fear and too happy to permit the presence of trouble. A second new club was added to the Pacific Northwest District in February. This club in Mountain Home, Idaho chartered with forty members. Welcome!